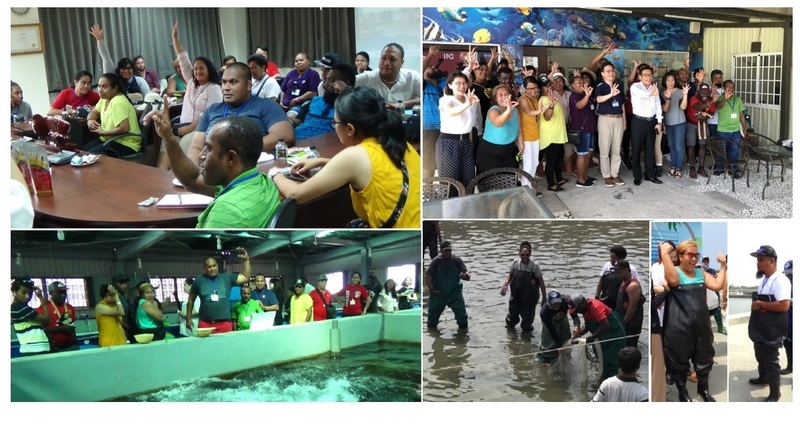 On September the 28th, led by the Ministry of Foreign Affairs, 23 youth representative of a training program from Samoa, Tonga, French Polynesia and Kiribati and other pacific states visited Tuna Rich Aquafarm. Our Group first led the representatives to our indoor breeding farm and also experienced the feeding process, the Groupers raised from the water fighting over the food, splashing the representatives wet creating laughter, joy and great interest to the program. Followed was a short briefing of our Fisheries Group business, demonstrations of our product, with tastings of products such as Milk Fish cookies. With the enthusiasm generated the representatives started with a Q&A session followed by a Quiz prepared by us. Afterwards was an outdoor farming experience, suited in “Frog Suits” the representatives tried bare handed fish catching. Finally the visit ended in laughter with a Lunch Party, serving Grouper dishes prepared for everyone’s delight.